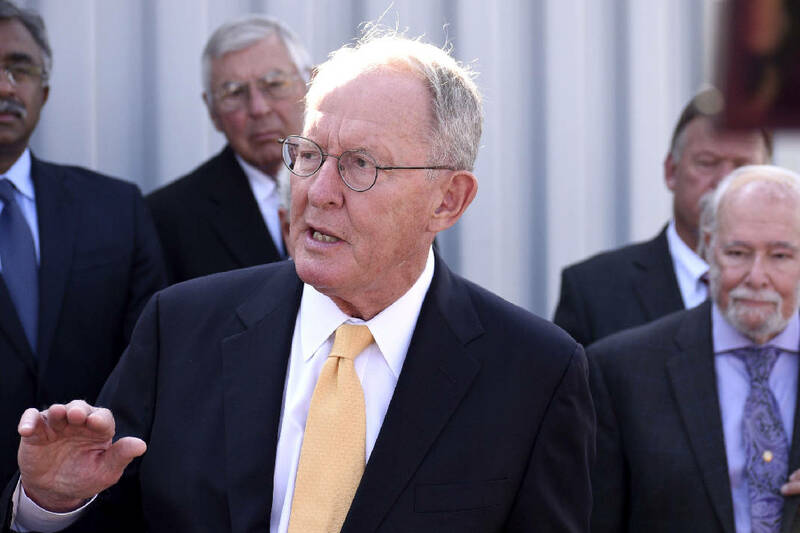 This story was updated March 26, 2018, at 11:08 p.m.
NASHVILLE — U.S. Sen. Lamar Alexander, R-Tenn., said Monday he's not supportive of proposals to arm school teachers in the wake of last month's massacre at a Florida high school that left 17 students and faculty dead. "I'm not a big fan of that. Again, that's up to states," Alexander, a former U.S. Education secretary, told reporters before a speech to the Nashville Rotary Club. "I think teachers have their hands full without carrying guns." In the GOP-controlled Tennessee Legislature, a bill that would allow for the training and arming of some teachers and school staff is moving in the House, despite reservations voiced by Republican Gov. Bill Haslam. There are similar discussions in Washington. Alexander, who is chairman of the Senate Health Education Labor and Pensions Committee, compared the situation to airplanes. "We don't arm pilots," he said. "We arm marshals who are trained professionals who ride the airplanes from time to time. So we need resource officers or policemen in schools, that's one thing. I think teachers ought to teach and let policemen have the guns." Last month's shooting spree at a Parkland, Fla., high school by what police say was a former student has spurred national discussion over gun-safety measures. A number of students from the school are urging new restrictions on guns and licensing, sparking demonstrations last weekend in many cities across the country, including Chattanooga. Alexander said he has supported five separate piece of legislation in the past few weeks to try and address gun violence, including his own School Safety and Mental Health Service Improvement Act. It seeks to change the main federal education law to let schools use existing funds to hire more counselors, make infrastructure safety improvements and fund violence-prevention programs. Alexander cited another bipartisan measure he backs, dubbed the "Fix NICS" bill, that seeks to improve reporting to the National Instant Criminal Background Check System. While Senate Minority Leader Charles Schumer, D-N.Y., backs the bill, the Democrat has noted it doesn't address what he considers the need for universal background checks for all gun purchases. During his speech to Nashville Rotarians, Alexander also raised concerns about President Donald Trump's push for steel and aluminum tariffs on countries that Trump says are selling below-cost metal to the U.S. Such measures are already having an impact on Tennessee-based manufacturers in a state where Chattanooga-based Volkswagen, Smyrna-based Nissan and Spring Hill-based General Motors have major operations along with some 900 auto suppliers. While a number of operations use U.S.-manufactured steel, the steel and aluminum tariffs will lead to increased costs of production and fewer jobs here, Alexander said. "That's not good for us," Alexander said. Earlier, Alexander was asked by reporters about whether he will seek re-election in 2020 and about recent comments by Tennessee colleague and fellow Republican Sen. Bob Corker. Corker earlier this month definitively ruled out trying to restart a re-election effort after announcing last fall he wouldn't run following nationally publicized disputes with Trump. Last week, Corker told the Washington Examiner that the president's support among the Republican base is "more than strong, it's tribal in nature" and that "people don't ask about issues anymore. They want to know if you're with Trump or not." "Well," said Alexander, a former governor, "it [the election] is not sneaking up on us. I'm just barely halfway through my term, and one of the reasons you have a six-year term is you don't have to think about things like that all the time. Look at Sen. Corker, he waited 'til about two months before the deadline before he made a decision." As far as the electorate these days, Alexander said, "we live in an internet democracy where everybody has their feelings, not just on their sleeve, but they put it into the internet immediately." He said Napoleon used to say that if you wrote a letter, you should wait 30 days before sending it and after waiting "probably wouldn't because it [the problem] would go away. Now nobody waits. And Congress reflects the internet democracy within, so it makes it a wild and woolly place." As for whether he will run again, Alexander said, "I'll make a decision about that at the appropriate time. I enjoy what I'm doing. I feel like I'm getting a lot done. I'm not getting everything done, obviously, with health insurance." But he said he generally is "enjoying" what he's working on and intends to "keep focusing on that, and I'll think about the next election on down the road."